Use this page to get detailed profiles of Chicago's neighborhoods and the North Shore communities - including photos, news, housing, market data, school ratings and more! Renowned for their incredible beauty, stunning architecture, and breathtaking lake and skyline views, Chicago's North Shore communities benefit a diverse clientele. Classic lakefront mansions, charming single family homes, quiet tree-lined streets, local coffee shops and quaint cafes, incredible shopping districts - these are just a handful of the amenities North Shore residents enjoy. Explore North Shore communities and real estate. 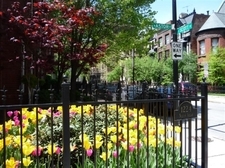 Chicago is often referred to as a “city of neighborhoods.” When exploring all of these great neighborhoods it is important to consider factors such as access to schools, proximity to transportation, neighborhood amenities and nearby recreational activities, ones that best coincide with your lifestyle. From towering skyscrapers to charming bungalows, Chicago gives homebuyers virtually limitless opportunities when looking for a home to call their own. Just about any neighborhood in the city offers a variety of housing styles and a choice between existing, new construction, or remodeled homes. Explore Chicago neighborhoods and real estate. Would you like assistance finding your next home? If you have any questions, please take a moment to contact me! I can send you email updates on new properties as soon as they hit the market, conduct several searches at once, and virtually compare different propects with you.